This page gives a brief introduction to the main pond inhabitants of the main Vernal Pool that I observe, and tips on how to see them. See Timetable of Animal Events at the Main Vernal Pool for when to see these critters after the Main Pool forms. The formation date for the Main Pool may be given on Current Status of the Vernal Pool, Flowering Plants, and SRP Trails. If not, call the Visitor Center. In the following, Day 1 refers to the day that the Main Pool first forms. Day 30, for example, occurs 29 days later. Most of the time, to observe the smaller critters, you need to lie on your belly on the boardwalk, or find some other way to place your face very close to the water. Note also that their density can depend strongly on time. To get an idea of the variation, see Changes of the Main Vernal pool on the Mesa de Colorado Vs. Time. Look at some pictures of the critters beforehand, and bring pictures with you if you can. It is of immense help to have seen a picture, since it is hard to describe such small critters well. For the fairy shrimp, you can study the picture on the display board with the bench just before the trail descends to the pool. Note that the shrimp, and many of the other critters, are nearly transparent, and are extremely small, so you'll have to work at seeing them. Lie down on your stomach with your face a foot or two from the water. Check at least four distinct areas near the boardwalk. There is a surprising variation in abundance of the critters along the boardwalk, and the optimum position can change during the day. Often the optimal places are just outside the central circular area, especially on the northeast and northwest sides. Usually, the worst place to look is in the central circular area. If the water is murky, and the sky is overcast, it is nearly impossible to see anything in the water. Also, if the wind creates waves on the surface, the water on the northwest side often has lower waves. Be careful about staring into the water too much when there are waves; it is easy to get seasick by looking at choppy water. You may wish to come back on another day. Don't let your shadow fall across the part of the pond you are examining; direct sunlight gives the best contrast. Have patience! Many times, one sees nothing for several minutes, and then all of a sudden your brain clicks and you see a huge number of critters. Fairy Shrimp, Tadpoles, Frogs, Toads and Snakes are the clear stars of the show at the Main Pool. Nothing causes more excitement among most visitors, especially children, than to see the garter snakes come for their tadpole lunch snacks. Second on the list is watching the tadpoles grow up to be frogs and snakes, with the highlights being when the babies grow legs and then when they emerge from the water and hop around on the boardwalk. Lucky visitors are enthralled if they find mating toads laying and fertilizing eggs, or snakes mating. Fairy shrimp are a highlight for many visitors. The name alone is magical and makes people want to see them; how many places in the world can you go to see anything alive that is named for a fairy? But seeing fairy shrimp is a much more subtle pleasure, primarily because they are small and hard to see, and there is only a narrow window of a few weeks to see the shrimp well. Maximum enjoyment in seeing fairy shrimp comes from knowing their amazing stories. Much of the following information is taken from a wonderful book, Fairy Shrimps of California's Puddles, Pools, and Playas, by Clyde Eriksen and Denton Belk, 1999, Mad River Press. Fairy shrimp are rare, and people love seeing rare species. All the other aquatic creatures found in the Main Pool can be found elsewhere wherever there are pools with fresh water. Fairy shrimp live only in increasingly-rare vernal pools. One of the fairy shrimp species at the Main Pool lives only in the pools of the Santa Rosa Plateau. Species hardly come any rarer than that. Fairy shrimp have an almost-unbelievable life story. They spend most of their lives as cysts, which resemble tiny (~0.2 mm = 0.01 inch) eggs, but actually contain embryos that have molted once or twice, and then gone into a state of suspended development called diapause. In other words, the baby fairy shrimps go into suspended animation! Amazingly, these living embryos in their cysts then are able to survive the dry, hot season. These cysts are so tough they can be heated to near boiling temperature, frozen for months, or be placed in a vacuum for 10 years with no ill effects! Cysts radio-carbon-dated as 10,000 years old have hatched when placed in water. The fairy shrimp's moment of glory in the sun comes when water returns to the pools. Within minutes to days, some, not all, of the cysts hatch and start swimming upside down, with their legs toward the surface of the pool. The rest of the cysts are programmed to go through one or more dry-wet cycles before they hatch, which protects the species if the pool dries up before the current crop can reproduce. However, as is often the case for rare and wonderful things, it takes much more work to enjoy the fairy shrimp, Sadly, most people who visit the pools either don't see them, or misidentify another critter as a fairy shrimp. For years, I have surveyed people coming back from the Pool, and asked them if they saw fairy shrimp. Many say 'no', even when the fairy shrimp are at their most visible. Many say 'yes', but when I ask them to describe the fairy shrimp, it is clear they have misidentified them. Many of these say 'yes' even when the fairy shrimp are all dead and no longer visible. To maximize your chance of seeing the fairy shrimp, come between Day 25 and Day 35 in the life of the Pool when they are most abundant and at their maximum sizes. Our two species grow linearly with time, and end up 1/2 inch (our own Santa Rosa Plateau fairy shrimp) or 1 inch (the vernal pool fairy shrimp) long by Day 30. Before Day 25 they are smaller; after Day ~38 the larger species is dead and gone. By far the best way to identify them is to be at the Pool with someone who can recognize the fairy shrimp and point them out to you. If you don't have a knowledgeable companion, go to the Pool and ask people who are lying on their stomachs with their face just above the water if they can point them out to you. If you come on a weekend, there is a good chance there will be a docent at the Pool who can help you identify them. To give you an idea of how hard the fairy shrimp are to see, see Photographs of the Fairy Shrimp. However, note that they are easier to see in person than in photographs, since they are moving. The human eye is wonderful at picking up movement. One problem many people have is that they focus on the large amount of debris moving along the surface of the water, instead of the fairy shrimp that are in the water column, typically about half way from the top of the water column to the bottom. Tip: look for creatures swimming in the opposite direction than that of the debris on the surface. However, the fairy shrimp can be seen as early as Day 4, when they are less than 0.1 inches long, by those who have seen them before and know what to look for. As early as Day 6 I have been successful in getting other people to see them, including being able to see that the shrimp are swimming upside down, with legs covering half their body. By Day 10, the fairy shrimp are 2-4 mm long (~1/8"), and are still nearly impossible to see until you first recognize them. However, after you see the first one, they are easy to pick out. For example, on March 2, 2000, when the pond was filled with a very high density of shrimp, one person told me that there weren't any in the pond! Even when I pointed them out to two other people while describing their characteristics, those people took nearly five minutes to observe them. On the other hand, at the same time, using the same tips from me, another person picked them out within seconds. Their distribution is often far from even in the pool, but when the shrimp are present, they can always be seen from some portions of the boardwalk. So look in several places and don't give up easily! Once you see them, you'll immediately have a positive id on them by noting that they swim upside down. They are about 1/2 - 1" long at maturity, their tail is about half their body length, and they have two antennae on the front. The white egg sacs make them much more visible when the eggs are present, after Day 30. We have two species in the pool, which differ by a factor of two in size at all times: Branchinecta lynchi, the vernal pool fairy shrimp; and Linderiella santarosae, our very own Santa Rosa Plateau fairy shrimp. There had been rumors that the Riverside fairy shrimp, Streptocephalus woottoni, was present here, but there are no records for it here. The Riverside fairy shrimp is found at the only pool in western Riverside County not at the Santa Rosa Plateau, Skunk Hollow in Murrieta, and also at a few pools in Orange Ccounty and a few pools in western San Diego County. The vernal pool fairy shrimp is the larger of our two species, maturing at about one inch long. This is called an uncommon, common fairy shrimp by Eriksen and Belk (1999), because it is present in many widely-distributed vernal pools, but it is not abundant anywhere; and when it co-occurs with other fairy shrimp species, it is always far outnumbered. My observations at the Main Pool show this to be true. For example, one day I estimated there were hundreds of Santa Rosa Plateau fairy shrimp in a column of water one square foot in cross-section, but only a few of the vernal pool fairy shrimp were in that same column. There is a major mystery here for this species. In many years, the entire population dies out suddenly on Day 38 to 40, when they are in their prime, even though they live to Day 70 to 140 elsewhere. Sudden death like this implies that something in the water has crossed some threshold that kills them all. No one knows what the cause is; this would make a great study topic for some fortunate biologist. The Santa Rosa Plateau fairy shrimp is the smaller of our two species, maturing at about one-half inch long. This species was formerly confused with L. occidentalis, but was recognized as a new species in 1994. The Santa Rosa Plateau fairy shrimp are separated from the nearest populations of L. occidentalis, in Ventura and Santa Barbara Counties, by 200 miles, so it is not surprising that they are a different species. Everyone who knows fairy shrimp loves Linderiella species, since they have easy-to-recognize red eyes on little stalks. It is a wonderful experience, especially later in the day, to look into the water and see all those red eyes swimming about. The Santa Rosa Plateau fairy shrimp usually mature by day 30, and usually live until day 50 or so, becoming obviously senescent near that time. Fairy shrimp in their prime swim with their bodies horizontally, and swim with purpose. Elderly Santa Rosa Plateau fairy shrimp have a hard time keeping their body horizontal, and swim sluggishly. We have never seen any evidence of a second hatching of the fairy shrimp, either in pools that last for months after the last fairy shrimp has died, or in pools that have dried up and reformed in a given year. In the Main Pool, we have one species of frog, the Pacific Chorus Frog, aka Pacific Treefrog, Hyla regilla, which is easy to recognize since it is small, 1-2 inches long, with an eye stripe. Along creeks we have an additional species, the California Chorus Frog, aka California Treefrog, Hyla cadaverina. This is the same size, but lacks the eye stripe. Adult Pacific Chorus Frogs are sometimes seen at the Main Pool, but they are nearly always heard there. These little frogs have gone Hollywood, and produce the loud croaking sounds you hear in any movie that wants to have the sound of frogs. Their voices are so loud that you'd swear they were coming from a frog five times bigger. We have two species of toads at the Main Pool, but you'll only ever see or hear the Western Toad, aka California Toad, Bufo boreas. Mr. Toad is easy to recognize, since he is twice the size of Mr. Frog, 2-5 inches long, and, of course, has warty skin, and best of all, has a beautiful thin white stripe down his back. If you pick up Mr. Toad, you'll get warts. Well, actually, that won't happen, but remember, this is the home of our wonderful creatures and this is a Reserve, not a Park. Please don't pick up or otherwise bother our critters. For pictures of each of these species, and good general information about them, see Frogs and Toads of Coastal Southern California by Robert N. Fisher and Ted J. Case, and Field Guide to Amphibians and Reptiles of the San Diego Region, Jeffrey M. Lemm, California Natural History Guides, UC Press, 2006. If you are very lucky, you may spot the eggs of the Pacific Chorus Frog or the Western Toad in the Pool. They are very easy to distinguish. 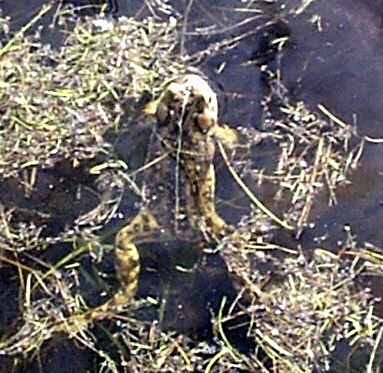 Frog eggs are not connected together; toad eggs are connected with stringy material. The Pacific Chorus Frog lays ~30 yellow eggs in a loose cluster. A femaleWestern toad lays long strings of hundreds to thousands of egg, up to 16,500 black eggs in her lifetime, with the male patiently riding her back and doing his part to make tadpoles. If you are very lucky, you may see the frogs and toads mating in the Pool, or, as one child put it, Look, mommy, the frogs are playing piggy-back. You may not want to hang around for the entire experience, since it can take up to an hour to lay all those eggs. For eight years, I thought strings of ~20-40 yellow uniformly-spaced "seeds" on an ethereal medium were laid by the Western Spadefoot Toad, but they are actually the spore cases of clover fern, Marsilea vestita. The tadpoles seen in the pond can come from either the Pacific Chorus Frog or the Western Toad. I don't know of any way to tell them apart while they are in the water. See tadpoles of Southern California to try to identify them. The rest of this page has not yet worked on, and is only an outline. The snakes in the pool, that are usually seen from 11 a.m. to 1 p.m. having their tadpole lunches, are Two-Striped Garter Snake, Thamnophis hammondii. They are not harmful, but they certainly startle anyone whose face is a few inches from the water when they suddenly emerge from under the boardwalk. the orange / red triangular-shaped Cyclops copepod, aka "Red Shrimp". These aren't shrimp, but they sure are red, and very numerous. These are probably some type of copepod, perhaps a Cyclops vernalis. Red Shrimp was only my original shorthand for them before I knew what they were, and as far as I know, no one else calls them by this name. They are about 0.2" long, have two antennae in front and a tiny tail. gray Daphnea, aka water fleas, aka "Gray Shrimp". These also aren't shrimp, but are a type of crustacean called Cladocerans. (I originally thought these were a "rotifer" because they seem to have rotors in front to propel them, but Hannah Nadel fortunately wrote and corrected me.) They are about 0.1" long. They move in spurts, like a swimmer propelled only by a scissors kick, making them easy to recognize from that feature alone. Gray Shrimp was again only my original shorthand for them before I knew what they were, and as far as I know, no one else calls them by this name. whitish seed shrimp, ostracods, looking like miniature Pac-Men due to the wedge-shaped opening in their shells for their bodies, and often with banded color patterns on their shell. A few chironomid midge fly larvae, looking like small red wriggly worms, are often seen just behind the bench on the boardwalk. They grow from 1/4 -3/4 inch long depending on species. They are blood-red since they contain a pigment similar to the hemoglobin in human red blood cells. They are often noticed when they are wiggling wildly since that's how they move about! One larvae is visible in the first frames of Ted St. John's fairy shrimp movie. Midges?. These are small black insects that you'll see along the edges of the boardwalk, or on rocks next to the boardwalk that stick out of the pool. There can be thousands of them on a single rock 6" in diameter. If you put your hand next to such a rock they'll cover your hand. One person said they were midges, but I haven't tried to identify them. "male mosquitoes"
Springtails, Isotoma viridis). These are very small (significantly less than 0.1") insects that hop along the surface of the water. They look white on the surface of the water. They can appear on the very first day that the pond fills, in huge numbers, and which love to congregate on the water surface and boardwalk edges by posts along the boardwalk. Their density fluctuates remarkably from day to day. There can be thousands of them per square foot of water surface one day, but be gone a few days later, and then return a few days after that. See data on their abundance versus time. long; this is the most uncertain measurement. inconsistent with the other 3 possible ids in that book. 1.  unk larvae. it looks almost exactly like the pix of the larvae of the water scavenger beetle in the field guide to animals of vernal pools, kenney and burne, p. 52. (this is the book i donated to the srp docent library some years ago, and gave kay a copy of as well.) order: coleoptera  family: hydrophilidae. >> > > arachnid. See the attached photograph. > > it looks like a tick! > > animals of vernal pools, kenney and burne. > > Water mites are familiar to everyone who ever observed pond water. Copyright © 2000-2008 by Tom Chester.